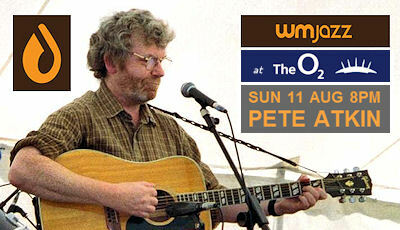 To confirm previous rumours, Pete will be playing live at WM Jazz at the O2 Greenwich on Sunday, 11th August. Please put it in your diary, details to follow. Refreshing this thread: don't miss the opportunity to see Pete at the Water Margin restaurant and jazz venue at the O2 Arena ('The Dome') in London's docklands. Now less than 2 weeks away, and booking! I see also that early Fairport legend Judy Dyble (who's a member of the PA/CJ Facebook fan group) is appearing at the same venue in September, and chansonneuse Barb Jungr will be there in October. I'll be there too. What's this eating business - anyone? it was a fabulous evening, The Water Margin is worth a visit for the food alone. Pete was on top form singing some old friends and new acquaintances - including BOTBS performed on Ukulele which was a real treat and a rare outing for National Steel. Others will post the full set list in due course but a great night was had by all who were there. Many thanks to John Waites for arranging the gig. The whole thing was a triumph! A terrific performance from Pete at WM Jazz at the O2. Ian Ashleigh, Sylfest Muldal and I were the only MV's present. Heather Bater was the girl in charge of advertising and the talented Fiona Egan was there. It was the inaugural gig at WM Jazz, and we were delighted and privileged to have Pete perform. The setlist was as follows. The couple of question marks indicate those where I'm unsure of the title. I would be delighted for these to be confirmed or corrected by those who are sure. At WM Jazz, we have folk rock deity Judy Dyble, founder member of Fairport Convention, performing on Sunday, 1 September, the amazing Barb Jungr on Saturday 5 October and the talented Fiona Egan on Thursday, 24 October. If you haven't heard Fiona's new album "Touch has a memory" please do, I think it's brilliant. Tickets for all three gigs from http://clubwm.co.uk/jazz/online-booking/ or Heather on 07581 319468. Personally, I hope to be at WM Jazz for Fiona Egan on 24 October and Watford Folk Club for Pete on Friday, 25. Blessed synchronicity. Thanks so much, John. It would be great if the venue turns out to be a continuing success, in which case I'd be even more proud to have kicked things off. Those new titles are still a bit unsettled, but your first question mark is more likely to be 'Too Late For Me' and the second half opener is probably something like 'The Way You Are With Me' (Clive's original title was 'Night Surfing Blues', but it's been through quite a few changes since then). For what it's worth, I took it too fast last night, I think. Oh yes, and for the record, the encore 'All I Ever Did' was on piano. Thanks so much John for putting on the show, and Heather too. A small detail for Smash Fluffs aficionados - Pete gave a bravura performance of Thirty Year Man in which the little girl was starting to begin too soon and all the napkins and glasses seemed to get mixed up. But you'd never know it. Somehow he still killed the kid on cue in the second verse and left the bones in the cave at the finish. I'm really sorry to have missed such a good night of music (well, it always is with Pete), especially as this was quite close to home. Bad timing on my part meant I was away on holiday, drat. I will just have to hold out untill the Watford gig in October - nice club with a good atmosphere as I recall. Thanks to all who reviewed the Water Margin gig. It sounds like a venue well worth supporting.